CAC Exceeds $2.4M Campaign Goal with Georgia Power Grant! 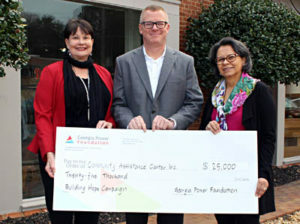 Georgia Power Area Manager Jeff Petrea (center) presents a check to Pam Jones,left, and Tamara Carrera of CAC. CAC is pleased to announce that we have exceeded our $2.4M Building Hope Campaign goal thanks to many supporters from throughout the community! The campaign goal was met in December thanks to a $300,000 challenge grant which was awarded after CAC raised an additional $300,000. In January Georgia Power “powered” CAC past its goal with a generous $25,000 grant! The successful campaign has positioned CAC to reach many more families and individuals throughout its service area of Sandy Springs and Dunwoody and enhance and add services designed to help clients lift themselves out of the cycle of poverty. Click here for more information on CAC’s successful Building Hope Campaign!